MIMF • View topic - Have you ever built an experimental batch of guitars with slight differences? Have you ever built an experimental batch of guitars with slight differences? I know that, at least, Alan Carruth has done experiments at various times as he has mentioned them here and commented on the difficultly of building "identical" instruments. 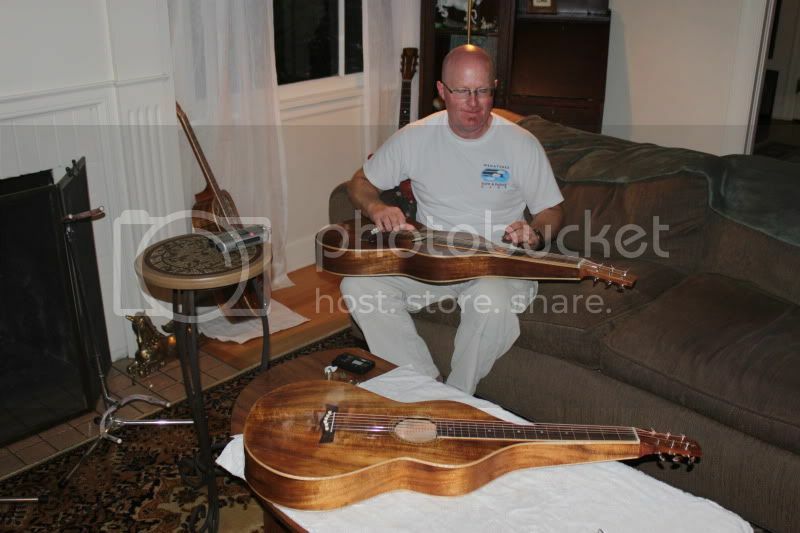 So far I have built guitars built on 4 different well known classical guitar plans. I have been toying with the idea of build 3 or maybe 4 guitars which would be as identical as I can manage in every aspect except the top thickness map and the bracing. (same plantilla). The objective being to see if changing the top actually makes any differences and if there is even a hint of the character of the original makes sound in the instruments. I often have the feeling that in the end all my guitars sound like "simon" guitars regardless of the plan. In a sense the idea of the experiment is to see if I can deliberately move the sound in a specific direction or not. A very tricky point is finding 3 or 4 extremely similar tops but I am giving it some thought. Anyone here tried something like that recently? Re: Have you ever built an experimental batch of guitars with slight differences? I built an entire year's worth of guitars with dovetailed necks to answer, once and for all, if dovetailed necks sound different than a bolt on neck. I did one guitar with three different tops so I could determine how I wanted to voice my tops. It was a very helpful exercise, for me anyway. "One of them was modified 9 times, with variations of tone bars, etc... One I thinned until it imploded, to see what would actually happen as it got lighter and lighter..."
Not long ago I modified one of my early mandolins that had a weak top. I turned it into a steel string ukulele. It works much better. I think the factories have proved the fallacy of trying to build identical guitars. The methods they use require them to build with standardized parts. 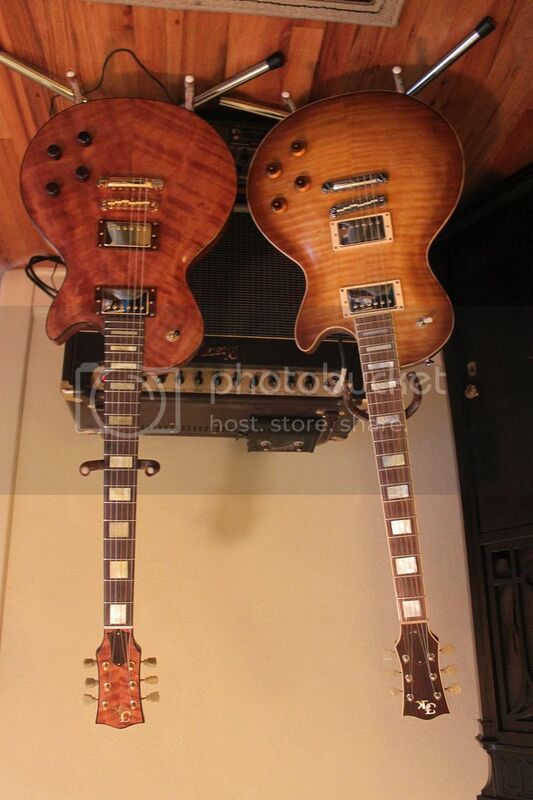 Even when it is the same model, the guitars don't all sound the same. Even when plywood is involved some sound much better than others. Clay, that's why i built a year's worth with the different neck system. It was completely random, yet no difference then, or now, could be attributed to the neck attachment system. 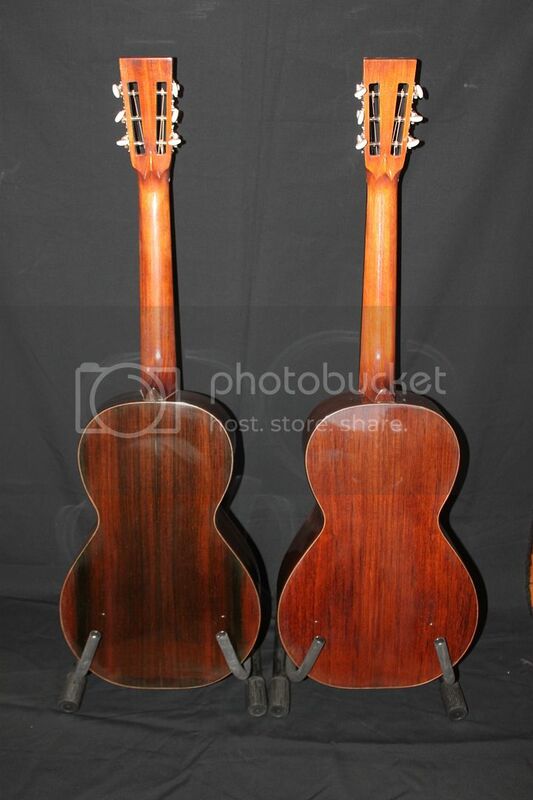 As for the mandolins with removable backs, they were the perfect test bed, as only one parameter would change on the otherwise unmodified instrument. I could do the changes quickly enough that only an hour or so lapsed between changes, so my memory of the tone was still fresh. I'd then leave it as-is for a few weeks to "break in" again before the next change. Learned me a ton....! "I think the factories have proved the fallacy of trying to build identical guitars. " The problem with factory production is the variation in wood. Building to a dimensional spec when the material properties can vary by plus or minus 20% (or much more, if it's cross grain stiffness) from one piece to another simply won't yield a uniform output. It's roughly like substituting brass for steel at random in machine parts, or mild steel for high carbon or alloy. Factories work by averages, add in a fudge factor to account for parts on the low end of the distribution, and rely on good design and production quality control to keep things within reasonable bounds. They don't necessarily even want things to end up 'the same', since customer tastes vary so much. So long as the instrument finds 'the right' buyer they have a happy customer. I've made pairs with variations before, and used them to make choices about the way I build. For example, I once made a pair of steel string guitars using 'the same' wood but braced the tops differently: one had my 'normal' Martin-derived pattern and the other used a double-X brace. Most of the folks who played them at an ASIA Symposium preferred the double-X by a little bit, and that's what I've been using since. More of my effort has gone into trying to make truly matched pairs though. I start with the most uniform wood I can find, cut pairs of pieces 'in flitch', match them as best I can for thickness, mass, and vibration properties, and control all the other dimensions as closely as possible. The latest pair of mahogany/Red spruce OMs ended up with impulse spectra that were 'identical' within the limits of measurement error up to 1000 Hz, but listeners in 'blind' tests could as easily tell them apart as they could a similar 'ringer' by another maker. There seem to be two issues at work here. One is that pieces of wood that test out the same in bulk still will have small local variations that change the way they vibrate at high frequencies, when the top and back in particular are vibrating as a lot of small areas. A close look at the spectra at higher frequencies shows increasing divergence in the pitches and amplitudes of the peaks as you go up, although the number of peaks in an octave, and the average activity, are broadly the same. In other words, neither instrument is 'better' than the other overall, they're just 'different'. This feeds into the way 'normal' hearing works. Even people with an average amount of age related hearing loss retain a fairly high sensitivity to sound in the range from 2000-4000 Hz. Since much of speech discrimination goes on in that range it's important. Also, as a rule of thumb, the senses are set up to detect changes or differences. This is because there are two things you know about things that stay the same, like big rocks or walls: you can't eat them, and they won't eat you. What you need to know about are the little sounds the tiger makes when he's sneaking up on you, or the way a berry changes color when it's ripe: small changes at the limits of perception. That's what seems to be happening on the 'matched' pairs; there's enough of the sort of differences people are keyed into that it's easy to tell that they're 'different', even though they are basically very similar. I'm not sure there is any way around this as long as we're making them out of wood. I will keep trying as opportunity affords, looking for more uniform wood and tightening up on the quality control. It's fussy, and time consuming, and I'm not too hopeful of ever making 'identical' guitars that sound 'the same', but it's worth a try. Failing that, it's hard to know just what we actually learn from pair experiments. You make a pair of guitars that are 'the same' except one has an ebony bridge and the other is rosewood, and they sound different. Are they more different than they would have been with the same bridge wood? If you're good at swapping out bridges you might try testing that, but what if they still sound different with 'the same' bridge? Swapping the bridge on one guitar is a much less useful test, since there is no way to compare the tone directly without a lot of time elapsing. Despite what people think they're not all that good at remembering the details of sound for more than a few seconds, and any sound in between can mess up the perception. As far as I can see the only other way to find out what a given change does for sure is to employ statistics. This is where production quality controls would come in handy. Suppose you could get into Martin or Taylor and measure the properties of all the wood sets they were going to use to make, say, the next hundred rosewood and spruce OMs or Grand Concerts. You'd check out everything you could that might bear on tone during the construction process, such as tap tones/'free' plate modes, weights, deflections, and so on. When the guitars were finished you'd do a complete acoustic workup on each one, and listening tests. This would be a huge, time consuming and expensive project, but you might get enough data to be able to start sorting things out. The issue is that Martin or Taylor would not learn anything from it that would be of any use to them; they're doing fine with the current business model. This sort of information is actually much more useful to individual luthiers, who tend to be working toward a particular sound for a specific customer. Given the number of instruments an individual can make it's hard to see how anyone can work up a statistically significant number of instruments for a study like this. The better your material and production quality control is the smaller the sample size you'd need, and that gets us, in the limit, down to matched pairs. If you could figure out the QC limits necessary to make really matched pairs then a lot of possibilities open up. For example, I have a WRC top in my stash that has properties that are almost exactly the same as a Red spruce top I have. They are, of course, both outliers of their species; the cedar is much denser than 'average' while the Red spruce has much lower density than is usual. The only acoustic property in which they differ significantly is damping: the spruce had damping that's about three times as high as the cedar. 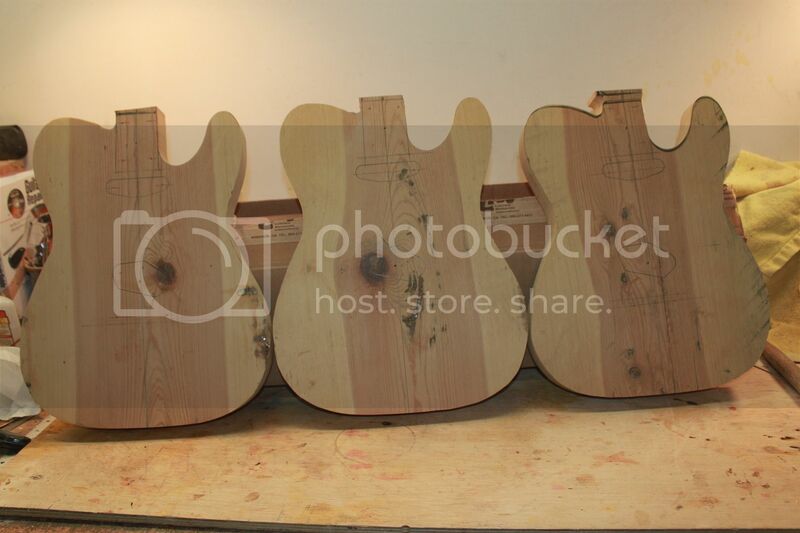 This is an experiment that is crying to be done, but it's hard to know how much you could learn from it if you can't make 'identical' guitars using 'identical' wood. If I can find another top that matches those two for density and stiffness along and across the grain then a matched trio might be a possibility, but that hasn't happened yet either. Hmmm. Don’t tell anyone one, but it seems like every guitar I have made has been experimental with slight differences. I’m hoping for a guitar with INTENTIONAL differences next. "As far as I can see the only other way to find out what a given change does for sure is to employ statistics." I agree with you on that. And that is where factories have an advantage. Building large numbers of guitars of the same model and with similar materials they can develop designs that give them acceptable results most of the time with a few great ones and a few duds thrown in as well. I try to build instruments that sound nice and play well, but I'm not really concerned with making them sound the same. As long as they are responsive to the players touch they can have their own voice. I will never build enough similar instruments to get a good statistical model from them, so I try to learn from the experience of others (factories and individuals). I think that scientific analysis can only take you so far, and that the final refinements rely on experience and intuition. "I think that scientific analysis can only take you so far, and that the final refinements rely on experience and intuition." It's certainly true that there's only so much you can learn about such a complex system from a few experiments, and that's about all any of us will ever manage. However, I think we can learn something about the limits of our control, and the reasons for those limits, and that's helpful. As custom makers we're all approached from time to time for a specific sound, possibly one 'just like' so-and-so's, and it can help in avoiding misunderstandings if you can tell the customer in advance what the limits of 'just like' really are. "It's certainly true that there's only so much you can learn about such a complex system from a few experiments, and that's about all any of us will ever manage. However, I think we can learn something about the limits of our control, and the reasons for those limits, and that's helpful. As custom makers we're all approached from time to time for a specific sound, possibly one 'just like' so-and-so's, and it can help in avoiding misunderstandings if you can tell the customer in advance what the limits of 'just like' really are." I agree with you 100% on that Alan. I think testing and analysis has a place in guitarbuilding. Some of us apply methods that are less rigorous than others -kinesthetic learning - rather than quantifiable measurements, but a combination of the two may give the best results. And as for producing a specific sound .... In the words of Harry Callihan, "A mans GOT to know his limitations ...... Do you feel lucky?"